Thanks for all of your kind words about my mom's knitted pieces! Yes, I do believe I got some of her genes. (Thank goodness - if I had more of my dad's genes, I'd have a blog about car mechanics. Or the Denver Broncos.) Someone asked about the pattern for the scarf; I just updated the last post to include a link to that. This is the first time I have thread traced all fabric pieces for a garment. 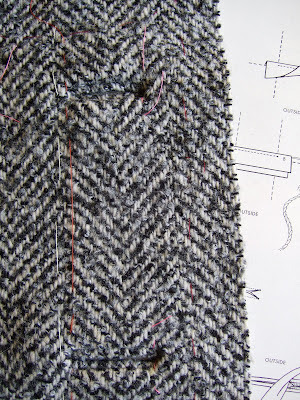 I decided to do this because the wool I'm using for my coat is somewhat thick and woven, I was concerned about the raw edges unravelling while handling the pieces, so I wanted to cut large seam allowances. Every single one of my fabric pieces required at least some interfacing (the hems, the upper bodice, the pocket openings), so I skipped the tailors tacks; after fusing, I thread traced each fabric piece in a single layer using the pattern piece pinned on as a guide (as described in Part 3 of Tany's tutorial). Yes, it takes a little bit of time, but I'm sooo glad I did it. I feel confident that I'm putting the pieces together accurately, and it's actually easier to sew the pieces together right along the thread tracing than to try to maintain the SA width by watching the gauge on the machine. Speaking of the coat, I am actually making progress. The first thing I tackled was the buttonholes. 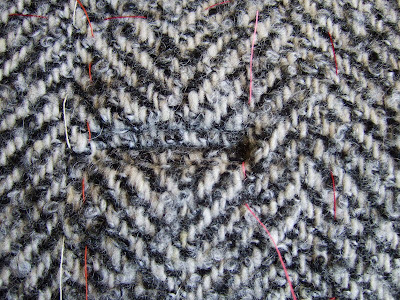 I tried a bound buttonhole technique described in The Bishop Method of Clothing Construction (thanks Cidell for reminding me to take a look at this book). It's found on page 192 of the book (the 1966 edition), and it's referred to as the "trade-method". I'm not sure that you can see the buttonholes very clearly, the herringbone fabric kind of hides the details (which may be a good thing). But I am really happy with how these turned out, and they were very easy to do. Wow! You are incorporating so many wonderful techniques in this coat! All of the time and effort will be so worth it in the final garment. And don't you just love the Edythe Bishop book!? To me these buttonholes look very pro. You're doing extra good! I'm glad you found my articles on thread tracing useful! I do make use of this technique very often and I developed my own way of thread tracing. It calms me down and I feel insurance, when sewing two pieces together, that I'm following the pattern outlines more accurately. Your buttonholes look perfect! And now I must add that book to my collection! Thanks for the thread tracing links! I always wondered if that was what she did! Now I'm off to read those!